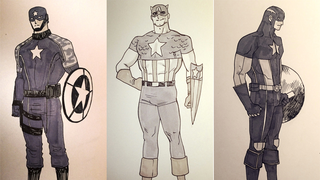 Comic artist Kris Anka is drawing a different Steve Rogers a day over on his tumblr, and half way through the month we've already got some wonderful doodles of Cap that show Steve loves changing his look just as much as he loves his country. Which is to say very, very much. So many Steves! Anka's already drawn 16 Steves so far, covering a variety of the character's suits from over his 74 years of service - with everything from the classic Jack Kirby look (top middle), the character's outfit as Nomad, and Yeoman America from Morgan Le Fay's reality-warped Earth-398. It's cool to see the doodle work of an artist as talented as Anka, and it's just as nice to see all the different iterations of Cap that we've had over the years - and how essentially the more things change, the more they stay the same. The outfits might get a shake up, but Steve will always stay close to his original roots. Check out a few more of Anka's Cap sketches below, but you can see much more over on his Tumblr.